A couple of week's ago I wrote a review on the OR Sun Gloves. From this review, several people alerted me to sun sleeves. I think if you hike in a long sleeve shirt, the gloves suffice. 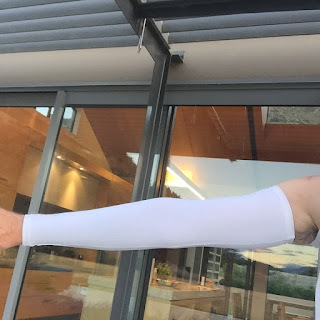 But if you're a T shirt hiker, these sleeves would be great on sunny days with, say suntan lotion on back of hands. SParms are made from 90% Meryl Microfibre and 10% spandex. UV 50+, cool and quick dry and antibacterial. They were developed for golfers and many of the Ladies PGA players use them. I know, you want to know the weight - how does 35 grams grab you? These come on large, medium and small sizes, standard and extra long, plus colours. I got medium and extra long as my Icebreaker T shirt has short sleeves. There is quiet a lot of stretch, so you need to take that into account. This photo shows how far up my arm the extra long goes. The cost was $A29.95, including postage $A37.23. Hi, I tramp with long sleeved nylon shirts but when I do the NW circuit of Stewart Island, I wear a cool max short-sleeved shirt as it dries very quickly on those multi-day trips. At that time of year, the sun is never a problem but a day in the rain is. My dear sister ran me up some possum/merino arm warmers to counteract cold damp arms even though I'm wearing 2 lightweight raincoats. I also wear a synthetic metallic yarn undersleeve as the wool is a tad prickly otherwise. So much more comfortable on a cold rainy day. Yup, I have these for golf on cold days - this is about sun protection. You want something cool and ability to wick moisture. Not to mention light - these do it !! i, I tramp with long sleeved nylon shirts but when I do the NW circuit of Stewart Island, I wear a cool max short-sleeved shirt as it dries very quickly on those multi-day trips. and rain coat jackets love it kindly add some more stuff about coats.